Each week Buck Run members are equipped through the faithful preaching and teaching of God’s Word at our scheduled services. 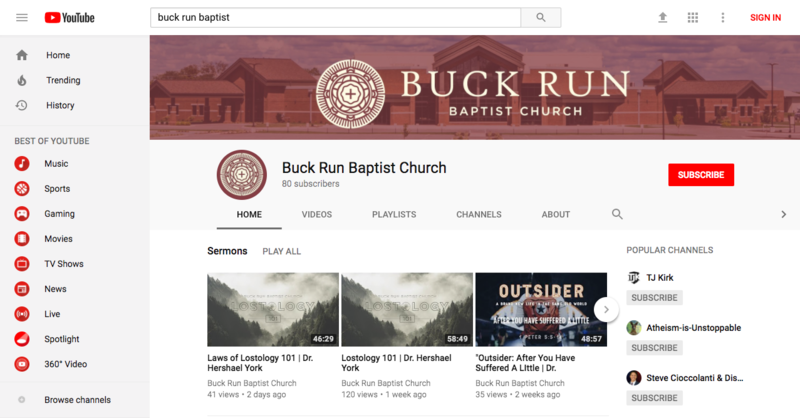 In an effort for more saints to profit from the Scriptures for teaching, for reproof, for correction, and for training in righteousness, a Buck Run YouTube Channel has been launched. This video-based platform features recordings of each week’s Sunday School classes, sermons, and mid-week Bible studies. The flexibility of the delivery of this content allows for the 100 volunteers that rotate serving in our kids, students, and security ministries each Sunday to still be invested in while they are caring for others in our congregation. Whether it is because of sick kids or family vacations, there are times when you cannot make it to church. It is now easy to keep up with your Sunday School class or the current sermon series. The YouTube videos are also easy to share on social media or by email/texting links which makes sharing a teaching you like friends even easier. Please take advantage of this great resource for your personal spiritual benefit and for the good of others by subscribing on YouTube!